To some he is Gay Stanhope Falcon, the freelance adventurer and trouble-shooter from Michael Arlen's 1940 short story. To others he is Gay Lawrence, the English gentleman detective portrayed by George Sanders in RKO films of the early 1940s. You may know him as Tom Lawrence, Michael Watling, Malcolm J. Wingate, or Mike Waring. Which one is the real Falcon? Who played him best? In which medium was he most dashing? And was he inspired by Leslie Charteris' Simon Templar (The Saint)? 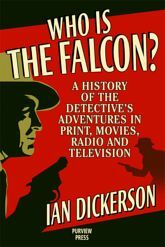 This is a comprehensive history of The Falcon, the fabulous private eye who was always "ready with a hand for oppressed men, and an eye for repressed women." You will uncover commentary on the character's birth in print, a complete overview of his time on the silver screen (including cast, credits, and reviews), a comprehensive log of his adventures on the radio (both in the United States and in Australia), and a full accounting of his television broadcast history -- plus photos and a full reprint of a Falcon story from Radio Mirror! Fully indexed. Written by Ian Dickerson.